Gonzaga forward Filip Petrusev, center, grabs a rebound against Central Washington. 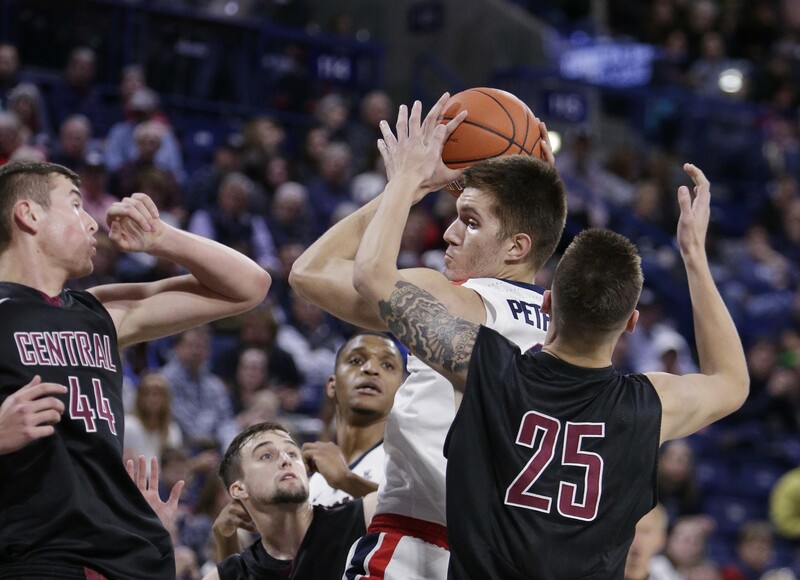 Sitting on the bench isn’t normal for Filip Petrusev, but such is life for a freshman big man in Gonzaga’s embarrassment of riches of a frontcourt. The 6-foot-11 forward had accomplished quite a lot in his young basketball career even before arriving on campus in Spokane. As a senior in high school he helped lead Florida’s Montverde Academy, a prep basketball powerhouse, to a national championship. Over the summer, the Belgrade native led Serbia to the 2018 FIBA Europe Under-18 Championship. In the tournament final he had a monster game with 29 points and eight rebounds. His Gonzaga career started off well, too. Petrusev averaged 15 minutes per game during the nonconference portion of the season. He was especially impressive during the month of November, when he averaged 11 points per game. It wasn’t just against weak competition, either. In a win over then No.-1 ranked Duke in the Maui Invitational Championship Game, Petrusev scored 11 points and grabbed four rebounds in just 12 minutes of play. On Saturday, against Portland, the worst team on Gonzaga’s schedule this season, Petrusev was on the floor for one measly minute. He’s averaging seven minutes per game in conference play and didn’t even see the floor against San Francisco. He’s gone from being an integral piece used in close games against the nation’s best teams to a garbage time performer against the West Coast Conference’s worst. That’s not his fault, at all. In fact, it’s nothing new for this Gonzaga program. Just ask one of the guys ahead of Petrusev on the depth chart: junior forward Rui Hachimura. As a freshman in the 2016-17 season, Hachimura averaged 4.6 minutes and 2.6 points per game. This year, he’s become one of the faces of college basketball and is averaging 30 minutes and 20 points per contest. Much like Petrusev, Hachimura showed flashes of his ability early in his freshman season. But once WCC play rolled around, Hachimura found himself on the floor only well after the outcome of a game had been decided. In the NCAA Tournament, it was even worse. Hachimura appeared in just three of the Zags’ six games, totaling six minutes played. In the Final Four and National Championship, Hachimura didn’t play a minute. Hachimura was a much more raw talent as a freshman than Petrusev is, but what really kept him off the court was the log jam of big men on Gonzaga’s roster. Przemek Karnowski, who won more games than any NCAA Division I player in history; Johnathan Williams, who went on to sign a contract with the Los Angeles Lakers; and Zach Collins, the 10th overall pick in the 2017 NBA Draft, were all ahead of Hachimura on the depth chart. As was fellow freshman forward Killian Tillie. Flash forward to this season, and it’s Tillie’s return from injury that has buried Petrusev on the bench. While Tillie was recovering from ankle surgery, Petrusev was Gonzaga’s third option in the post behind Brandon Clarke and Hachimura. Now that Tillie is fully healthy, Petrusev sits in fourth. There simply aren’t enough minutes to go around right now for Gonzaga to play four big men. Hopefully Petrusev is aware that the situation he’s in might not seem ideal — basketball players typically want to play basketball, after all — but it’s not actually a problem. Hachimura went through the exact same thing, and now he’s a household name and heading to the NBA. Tillie, too, even though he was part of the rotation as a freshman, has seen his playing time and profile skyrocket in the seasons since. It used to be standard for freshmen, no matter how highly touted they were — and Petrusev, ranked as the No. 56 high school player nationally in the class of 2018 by ESPN, qualifies as highly touted — to spend time playing behind the upperclassmen. These days though, teams like Duke and Kentucky, the monsters of the sport, put together rosters loaded with freshmen. When Gonzaga played Duke earlier this year, four of the Blue Devils’ five starters were freshmen. One of those four, Zion Williamson, is the runaway favorite to win national player of the year. But, Gonzaga’s different. It’s a program with a track record for developing players, especially big men. We might forget about Petrusev a little over the next few months as his playing time dwindles. But if history repeats itself, Gonzaga fans stand to be very happy once Petrusev reintroduces himself sometime down the road. And the big man from Serbia does, too.